Well, I wasn’t going to update for a few days, but my friend Lena from Montana was visiting and we made soup for supper and it was *so* good that we just had to share it. We didn’t really measure, and we just used what we had in the fridge, but it turned out *amazing. * So take our ideas, use what you have on hand, and tweak to your own taste. The flavor reminds me of Taco Bell’s Salsa Verde, which I love. Fresh, green, with a hint of spice. Kind of a Mexican-inspired dish. We served the soup with Gwen’s bread, and I made a batch of Tummy Tucking Ice Cream (recipe found in the book Trim Healthy Mama) for dessert. 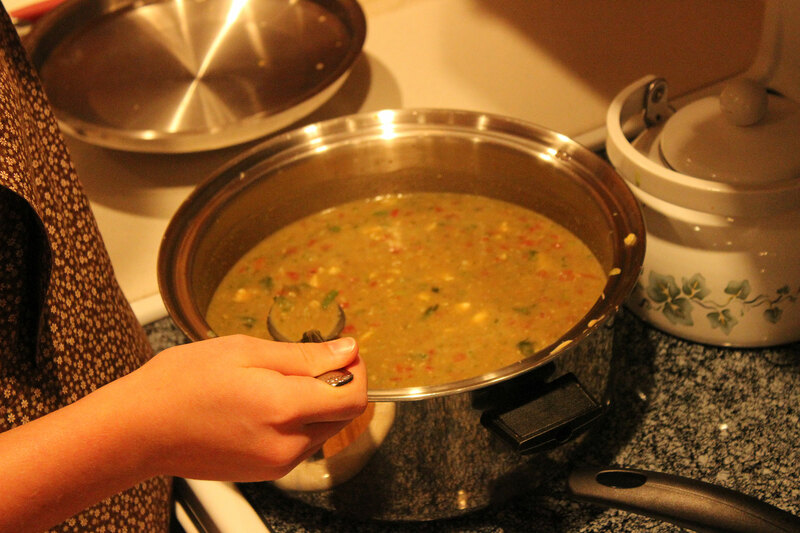 The soup received rave reviews by the family; and as the weather is cold and nasty right now, soup hit the spot. If you have trouble coming up with E meals, this is a quick, easy solution. It’s filling, especially when served with an E bread of some sort. You can pin this post here. You can find this recipe with an updated picture in my cookbook, Necessary Food. Cook the chicken, onion, water, ¼ cup fresh cilantro, bouillon, garlic, and spices together in a large soup kettle until the chicken is cooked through. In a blender, blend the water, spinach, cauliflower, refried beans, and the other ¼ cup cilantro together until smooth. Add this to the chicken mixture. Add the beans, tomatoes, corn, and lime juice/zest to the soup kettle as well and simmer everything together for 15-20 minutes. Taste and add salt if desired. Feel free to substitute with what you have in your fridge. That's how this recipe was born. I made my own version of this yesterday out of my bits and pieces in the fridge and it turned out great! I was boiling venison bones, si used that broth and bits of meat along with some chicken broth from earlier in the week. I would never have thought of blending greens but we have fresh kale growing so I blended some of it along with cilantro that I had stuck in the freezer a couple of weeks ago. Perfect way to get more greens into my children! And the fresh lime juice I squeezed into my bowl! Yum! I like your fresh ideas!